Note: Query Editor is part of Power Query. For a quick video on how to display Query Editor, see the end of this article. Power Query enhances self-service business intelligence (BI) for Excel with an intuitive and consistent experience for discovering, combining, and refining data across a wide variety of sources including relational, structured and semi-structured, OData, Web, Hadoop, and more. Interested in seeing Power Query at work? The Power BI - Getting Started Guide has a section that shows Power Query being used to create a workbook that connects to external data, transforms data, and creates a data model. You can read the entire guide, or jump to its Power Query section. With Power Query, you can share and manage queries as well as search data within your organization. Users in the enterprise can find and use these shared queries (if it is shared with them) to use the underlying data in the queries for their data analysis and reporting. For more information about how to share queries, see Share Queries. Find and connectdata across a wide variety of sources. Merge and shape data sources to match your data analysis requirements or prepare it for further analysis and modeling by tools such as Power Pivot and Power View. Create custom views over data. Use the JSON parser to create data visualizations over Big Data and Azure HDInsight. Import data from multiple log files. Create a query from your Facebook likes that render an Excel chart. 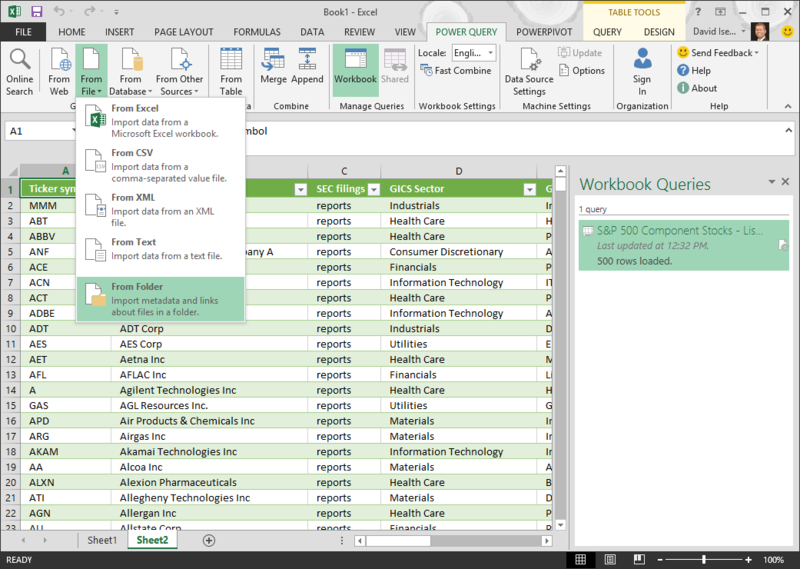 Pull data into Power Pivot from new data sources, such as XML, Facebook, and File Folders as refreshable connections. With Power Query 2.10 and later, you can share and manage queries as well as search data within your organization. The Query Editor only appears when you load, edit, or create a new query. The following video shows the Query Editor window appearing after editing a query from an Excel workbook. To view the Query Editor without loading or editing an existing workbook query, from the Get External Data section in the Power Query ribbon tab, select From Other Sources > Blank Query. The following video shows one way to display the Query Editor.